The TV reality show star Chris Soules made headlines last week when he was allegedly involved in a hit and run accident in rural Iowa. Based on reports, it appears that Soules, best known for his season of “The Bachelor,” was driving a pickup truck when he rear ended a tractor. The tractor was thrown off the road and into a ditch, while Soules’ truck landed on the opposite side of the road. Kenneth Mosher, the farmer driving the tractor, was later pronounced dead as a result of his injuries. He was laid to rest this week. The story has garnered some attention in agriculture circles because Soules’ claim to fame on “The Bachelor” heavily revolved around his life as a farmer in Iowa. Prince Farming, as Soules may or may not be known by some single farmer’s daughters, even brought the show’s final contestants home to the farm to meet his family. Following last week’s incident, many lambasted Soules for allegedly drunk driving, allegedly fleeing the scene of the accident, and allegedly not being a very good person. For a moment, let’s forget about the alleged alcohol use and fleeing the scene. The reality is that this type of accident can and does happen to farmers all the time. Spring and harvest are obviously the busiest times of the year for those in agriculture. For many of us, moving our equipment from one field to the next requires using public roadways. Unfortunately, other drivers on the road can be distracted, impatient, drunk, or employing a whole host of bad driving decisions. This leaves our equipment and its precious cargo vulnerable to a potentially severe accident, which could even be fatal. We have seen it countless times ourselves even though we live in a rural area and only use country roads to transport our equipment. Drivers have tried to pass on blind curves or hills. Some follow the tractor way too closely. A lady in a van passed our combine, the truck pulling the corn head, and three other cars all at one time. One guy even drove into the ditch and through a field to get around us. Farmers can use all the hazard signs available and employ all the right safety protocol, but that does not mean nothing bad will happen. Of course, there are plenty of people that are exactly the opposite and kindly accommodate our big equipment. They pull off into a driveway or a parking lot if they see us coming. They put on their flashers to warn other vehicles behind them. They patiently wait while we maneuver tiny driveways into our fields. Considering that it is either my dad or brother in that tractor, I cannot express how thankful I am to see people exercise the caution the situation deserves. Even still, bad things can and do happen. I know a lot of people want to throw daggers and stones at Soules and make him out to be a horrible person because this accident happened and the circumstances surrounding it. Maybe in real life he is a horrible person, or maybe he feels horrible about what happened and it will stay with him forever. I don’t know and, quite frankly, I don’t care. Sure, as a fellow farmer, Chris Soules should have known to watch out for tractors on the road in rural Iowa during this time of the year. But for whatever reason, that didn’t happen. 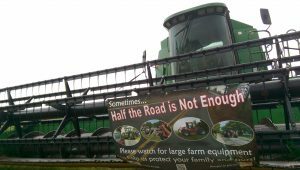 Even farmers can make a deadly mistake when it comes to distracted driving. Instead of the farming community gossiping about Soules and the mistakes he (allegedly) made, we should use this opportunity to remind people that accidents can and do happen. The plea for patience, safe driving, and being mindful of farm equipment on the roads is the real deal. Thankfully, we don’t often get celebrities, even reality stars, involved in motor vehicle collisions with farm equipment. So, when we hear people talking about it, we should use the opportunity to harp a little more about road safety during these busy times of the year. Let’s reframe this story to tell people what happened to Mr. Mosher and how it could happen to any one of our farmers. It won’t erase the tragedy or ease his family’s pain, but it might be able to protect and save another farmer. 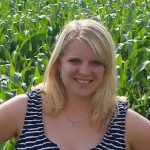 Amanda Zaluckyj blogs under the name The Farmer’s Daughter USA. Her goal is to promote farmers and tackle the misinformation swirling around the U.S. food industry. The AGDAILY Digest is the information superhighway for your country road. You have been succesfully registered! Any views or opinions expressed in this article are those of the author and do not reflect those of AGDAILY. Comments on this article reflect the sole opinions of their writers.